I’ve always been a big fan of black-on-black cars, so the fact that Porsche introduced a hat that follows suit is a win-win in my book. 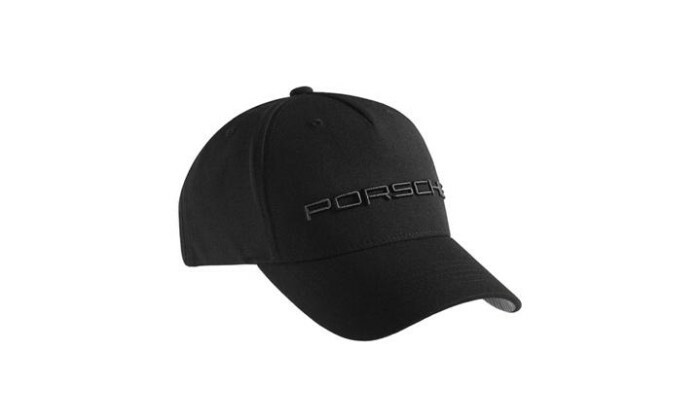 The cap itself is made of 97% polyester and 3% elastane with the 3D embroidered Porsche logo in all black stitching. It is fully adjustable via a strap in back, and the rear section consists of a breathable mesh for those who sweat excessively from their dome. The best part is the underside of the bill which has a slick carbon-fiber style look to it. Overall, this is one of the coolestautomotive brand caps we’ve come across. This jacket is not only stylish but also windproof and water-repellent, with enough padding to keep you warm without being at all bulky. The black embroidered Porsche logo is very subtle and small, placed just above the left breast pocket. There are lots of pockets on the front (4 to be exact) and 3 decent size ones inside as well with various zippers and/or press studs to keep stuff locked down. The zipper line has blue accent marks as do the interior seams which look great juxtaposed against the jet black of the jacket. 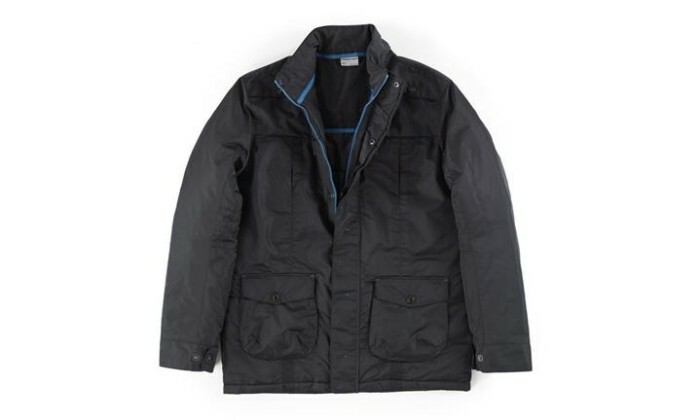 Another attractive feature of this jacket is that there are plenty of adjustment opportunities for those who prefer a more fitted look, with additional studs on the waist area and cuffs to tighten things up if need be. 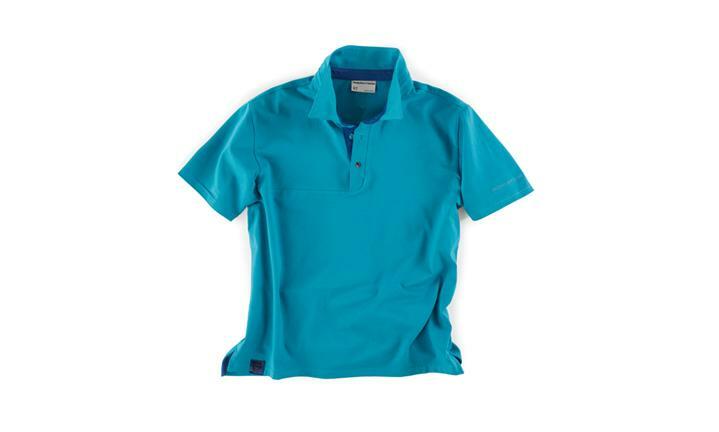 This polo is super sporty, has a great aqua color and is casual enough to be worn for leisure. It’s made of 94% cotton and 6% elastane and has a unique seam that runs down from the collar across the chest to the right. This is the one piece from the collection that is a bit flashy but only because of the lively color. You will either love it or hate it, but I dig it. 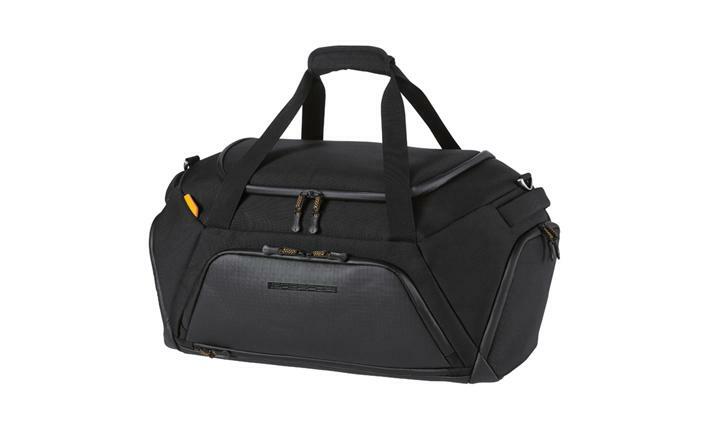 For those travel aficionados, have you ever wanted the form factor of a duffel bag without ending up with unrecognizable blobs of fabric upon getting to your designation? Well you are in luck with the Metropolitan Collections M travel bag. This black bag has taken the duffel form factor, added some sleek lines and contouring and actually manages to keep its shape to boot. It’s made out of 60% nylon and 40% polyester making it easy to wipe clean both inside and out and, just in case you get stuck in the rain or happen to love jumping in large puddles, the zippers are splash-proof. An adjustable shoulder strap and traditional handles offer a choice of carrying options. Other niceties include a leather address tag that’s removable as well as a laundry pocket and a ventilated shoe compartment which allows you to slide in your kicks from the side. As with many of its other apparel offerings, Porsche does a terrific job with the contrasting accent color which in this case is orange. Overall, the Metropolitan Collection from Porsche is a solid line of merchandise that focuses solely on delivering high-quality goods and successfully avoids making you look like a walking billboard. The black-on-black approach and use of contrasting accents gets a strong nod from us. Once again, Porsche excels with a combination of subtlety, innovation, superb design aesthetic, and meticulous execution.